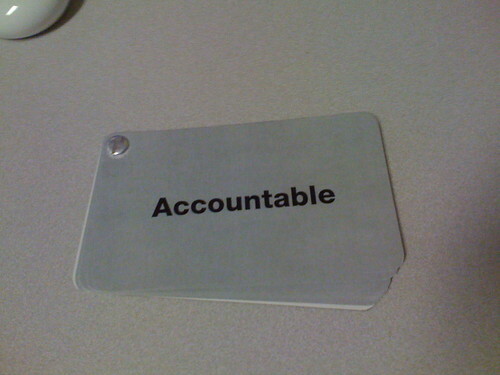 Work gets done because people are accountable. KM also will get done if individuals are given accountability. put in place a reporting chain though which that job or work is assigned and delivered. Let me give you two examples of how this operates, using the vectors of Communities of Practice, and Lesson-Learning. The description below is based on a number of organisations who work in this way. 1) The organisation has a clear idea of the functional competencies it needs to be successful. 2) These competencies are owned by senior staff, working through competency owners, competency committees or functional excellence teams. These staff/committees/teams have targets and deliverables relating to competence protection and development. 3) The leaders of the networks and communities of practice report to these senior staff, and hold a business plan or performance contract with the senior staff, stating how they will develop the CoPs in service of competence. 4) The network leaders take accountability for the development of the CoP and for the development of the community knowledge base. They may have a small team (for example a community facilitator) to help, and may have a small budget or community business. If this accountability chain works well, then the network leader can track the development of competence through CoP metrics, including success stories and performance metrics. They report this upwards to the senior staff, who report against their own targets and deliverables. 1) The organisation has targets for project delivery (cost, time or quality targets). 2) These targets are owned by the Head of Projects, or some similar role. 4) This team, with the backing of the Head of Projects, takes accountability for the delivery of effective "learning from experience" within the project context. They monitor delivery of learning against the company expectations, they facilitate the lessons identification, and they operate the lessons management process, they drive re-use. If this accountability chain works well, then the network leader can track the development of effective learning through metrics, and through improved project delivery (including learning curves). They report this upwards to the Head of Projects, who reports against their own targets and deliverables. In both these cases, KM is given a job to do ("Improve or protect functional capability though CoPs and CoP knowledge bases", "Improve company performance through project learning"), has individuals accountable for that job, and has a reporting chain. The job is clear, performance is tracked. That's how you really embed something for the long term.